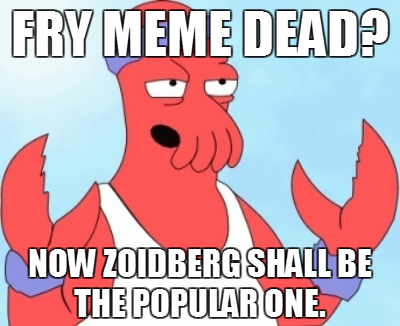 Welcome to the meme world, a world where memes are living together in harmony and peace. Or at least, that was what you all thought you did. Unfortuantly, you have no clues on who these hostile memes are, you are not even sure if they are in plural? Is this the work of a single entity? Several groups? Or just one powerful group of hidden memes destroying all that comes in their way? Who knows? This is something you have to discover, and hopefully before its too late and you all have less popularity than Justin Bieber, and the hostile memes have gained all attention in the world! This game will have typical rules as always. Use common sense for anything that isn't listed. If there is something you want to ask, feel free! If you are in doubt, then ask. - Votes and Unvotes are to be written as ##Vote and ##Unvote respectively. - Any time the vote count or the time remaining is asked for, please request it by writing ##Vote Count and ##Time respectively. - If you would like to ask a question directly in game, do so by writing ##Mod before your question. - In the event of a tie at the end of the day, there will be random coin flip (or similar effect for more than 2 at the tie) to determine which one will be lynched. - The first day will be 72 hours long. The following days will be 48 hours long, unless the mod finds it suiting to give longer days. - Extensions may be requested by writing ##Extension. Whether they are accepted or not will be under my judgment as to whether or not they are merited. - Regarding night phase, some people use unnecessary long time to send in night actions. Please do this as quick as possible, and the deadline will be set to 48 hours to do this. If this is not done, then your action will be forfeited, unfortunately for you. - I expect activity from people. If I see lack in activity I will give a warning and prod the people that it concerns. If this does not work then I will replace that person or use modkill. I expect at least one post for the day, but should be more than just one. - Do not edit your posts. - Do not quote anything outside the topic, be it messages or conversations with the Mod. *The last two rules can result in a modkill if defied. Please use caution to not break any of the rules, but especially these two. Several people have requested there to be no player list, so I have accepted this. "Finland; Be afraid. Be very afraid"
Day One ends in 72 hours, at 22:00 (10:00 PM) GMT on Sunday, March 4th. With 17 active votes, it takes 9 to lynch. Last edited by masteraleks on Sun Mar 18, 2012 4:58 pm, edited 15 times in total. Good morning memes of the world! So... soviet dude... still in player list, confirmed by the mod? HaI gAIs! !11 HOw R u? iM lIKe sOoOoOo ExITEd tO PlAy DIs gAMe wiT u ALL <(^.^)>. I MEen, wHO WoULdNt WAnT TO pLAy wIt SUch cuTE KITtenS LiKe m(>'.'<)m. OooHH111one!!1shift! !1 wE HAvE AN XBOX heRe TOo? i LUV XbOXs, Teh gAMes R SO muCH fUN TeE hEe ^_^. SoO N E WaYZ, I dUN UssUALY TAlk lIkE DiS, IT LiKe ONly HAppENS WHeN Im EXiTED LiEK, SO GiV mE A SeC tO CAlm doWN. So liek I also liek cake and stuff, but peanuts are way better and like, seriously. Theres like, also alot of beetles heer or sumthing. So anywayz I dun think I trust the guy who constantly reads peoples status, since liek he was bad in one of the erlier games liek. Food for thought, ladies and Gentlememes. Oh god, there's no way I'm reading an entire game's worth of posts that look like this.